Remember that retro iOS ’86 concept theme for iPhone that popped up recently? We were hoping it would become an iOS theme, and it has. To use the iOS 86 theme you’ll need to jailbreak your iPhone or iPod touch running iOS 5.0.1, here is how to do that with absinthe for iPhone 4S, or use redsn0w for jailbreaking other iOS 5 devices. 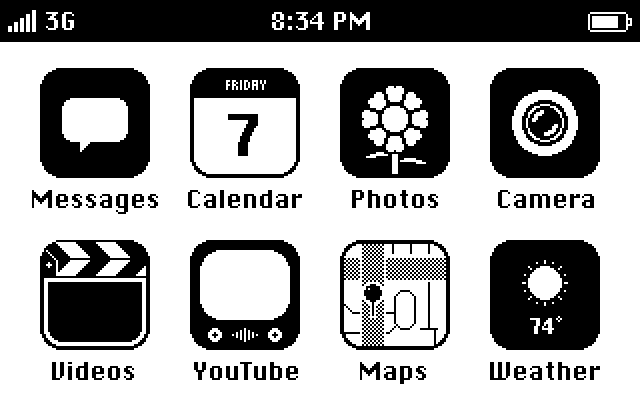 I haven’t had the time to test this quite yet, but apparently the theme doesn’t change other UI elements or any icons outside of the iOS 5 native set, so if an app isn’t bundled with iOS don’t expect a nice retro black and white icon. Nonetheless, this is a great first start and it’s pretty cool for those of us who were impressed with the original concept. Oops, thanks for pointing this out! The address should be repo.ithems.it, pls correct. Anyone got a link for a completely white background? Hey, the thing I did to get a white background was I opened Safari and then went to Google and then Google Images. I searched white background and then found one of the larger sized pictures that appeared from the search. I saved the suitable picture to my photos and then set the saved photo as my home screen background. You might have to scale the picture a little bit but it worked well for me. No Photos icon on iOS 5.1?